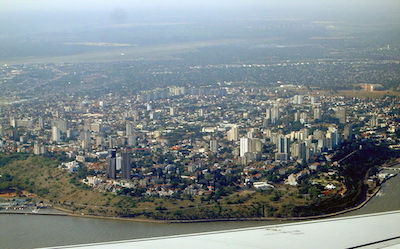 Maputo, (formerly known as “Delagoa Bay” and “Lourenco Marques”) is the largest city in the Republic of Mozambique and the country’s political and economic center. The city is located along the south Indian Ocean coast of Mozambique and has a population of 1.8 million. It is known for its beaches and for its deep-sea harbor that provides access ports for oceanic trade. The Dutch first established the settlement as a coastal trading post in 1721. After a few years the British took control of the post and transferred it to the Portuguese in 1781. African locals nicknamed the post “Xilunguine,” which meant “The white man’s place.” Portugal established a military fort at the post in 1787 and ultimately the area grew into a town. In 1898 the town became the capital of the Portuguese East Africa Colony. The Portuguese changed the town’s name from “Delagoa Bay” to “Lourenco Marques” in honor of a 16th century Portuguese trader. In the 1870s, even before declaring the city of Maputo the capital, the Portuguese began to develop it due to its proximity to the South African gold and diamond mines. The Portuguese constructed railroad lines and roads to bring South African minerals to the city’s harbor for export. By 1900 Lourenco Marques became a primary exporter of South African goods. Agricultural products from Portuguese East Africa including cotton, cashews, sugar, copra, tea and sisal, were also transported to the city for export. Lourenco Marques was a racially segregated city. The Portuguese lived in a plush affluent all-white area nicknamed “Cement City.” Residents in Cement City enjoyed public gardens, parks, paved sidewalks, marble-faced public buildings, and wide boulevard avenues. Africans were required to live in the “canico” or “reed-built” shantytowns on the black side of town. The canico received few city resources. This racial segregation reminded blacks of their inferior status in the Portuguese world. Blacks found various ways to resist the racial policies of the Portuguese. In the early 1800s the Shangana people attacked Lourenco Marques and sacked the city garrison. In the 1940s high school students led a local rebellion in the city. Due to the strength of Portugal’s International and State Defense Police, many anti-colonial protests such as this one in the capital were violently crushed. The strong Portuguese military presence around Lourenco Marques meant than as late as the 1970s Mozambique’s most successful anti-colonial organization, Frelimo, was forced to organize in the rural areas of the colonial North and the neighboring non-Portuguese territories. It was unable to operate near the colonial capital. Ironically, it was this sense of invulnerability that persuaded the Portuguese to hold on to the colony a decade and a half after surrounding African nations gained their independence. Today Maputo manufactures shoes, tobacco, aluminum and rubber. It is the home of numerous cultural institutions, including the University of Eduardo Mondlane, the Natural History Museum, and the Museum of the Revolution. The city is organized into seven townships and sixty-three neighborhoods. An elected city council consisting of a president and fifteen councilors govern the city. Colin Legum, et. al., Africa: A Handbook to the Continent (New York: Frederick A. Praeger Publishers, 1966); Alvin Josephy, Jr., et. al, The Horizon History of Africa (New York: American Heritage Publishing Company, 1971). George Ndege, Culture and Customs of Mozambique (Westport, CT: Greenwood Press, 2007). (Westport, CT: Greenwood Press, 2007).